Chemical flame retardants have been prominent in the furniture industry ever since California passed Technical Bulletin 117 in 1975. Although specifically related to upholstered furniture, these strict burn test laws certainly paved the way for the use of chemical flame retardants in mattresses as well. Now you can buy a Flame Retardant-Free Mattress in Raleigh Durham at Green Dream Beds. Luckily laws have changed since the time of 8-tracks and bellbottoms. Consumers and lawmakers are beginning to realize the dangers of these chemicals which has lead to positive developments in both the furniture and mattress manufacturing industries. Harmful chemicals are being swapped out for natural flame barriers such as organic wool, and discussions about the personal health and overall environmental consequences of these toxins are happening every day. However, this doesn’t mean that chemical flame retardants aren’t still an issue. Since they are not illegal and they are a cheap, easy way to pass the open flame test, they are most certainly still found in homes across the country, not to mention that we all have some older furniture pieces in our homes that were most likely exposed to these chemicals. Keep reading to learn about the history of chemical flame retardants, the health risks, and what other flame barriers are out there. As we all know, smoking was much more popular in the 70’s than it is today and as people dozed off with their cigarettes in hand, things got a little heated. Instead of focusing on the issue of cigarettes in the first place, the tobacco industry pointed at furniture. And so began the introduction of harmful chemicals to combat the consequences of a toxic yet profitable product. These chemicals were touted as totally harmless and as a positive introduction to the home since they were meant to decrease the number of deaths in house fires. However, it has since become known that chemical flame retardants do much more harm than good. The 2013 documentary, Toxic Hot Seat, doesn’t shy away from the heat surrounding chemical flame retardants. The documentary covers a lot of ground, interviewing politicians, scientists, journalists, and firemen about the dangers of chemical flame retardants and what type of impact they have on the health of future generations. The Chicago Tribune published a six-part series that looked into the multi-billion dollar industry of chemical flame retardants and the deception that lied behind it. Scientific studies were taken out of context to push forward a money-making agenda and health risks were never truly tested or made public knowledge to consumers. Instead, there was this inherent belief that chemical flame retardants were here to help us and that anything on the market must be safe for families. It is worrisome enough that firemen are dying of cancer due to chemical exposure (the documentary highlighted that the rate of breast cancer among female firefighters aged 40-50 at the San Francisco station was six times the national average) but it’s even more concerning when we look at how children are affected by chemicals that are depicted as safe. Polybrominated Diphenyl Ethers (PBDEs) are found in over 90% of Americans and children have three times the levels as adults. Chemical flame retardants aren’t simply stagnant on a piece of furniture. These chemicals travel through dust particles floating in the air. Children ingest these toxins at a seriously alarming rate and even begin consuming them as an infant when drinking breastmilk. Harmful chemicals from your mattress(es) and furniture may be floating all around you. Here’s what you can do to avoid them. Buy a Flame Retardant-Free Mattress in Raleigh Durham at Green Dream Beds! Although this documentary focused heavily on upholstered furniture, TB 117 lead to the use of chemical flame retardants in the mattress industry. There have even been toxic chemicals found in baby products and pajamas. The list goes on and on. In 2007, it became required for mattresses to pass an open flame test. A chemical that became a popular pick for treating casings? Boric acid. Boric acid is known for killing roaches but it’s also used as a flame retardant. Health risks associated with the chemical include infertility (for both men and women), irritation to the lungs, and anemia, just to name a few. A chemical may seem like an easy fix but at what cost? 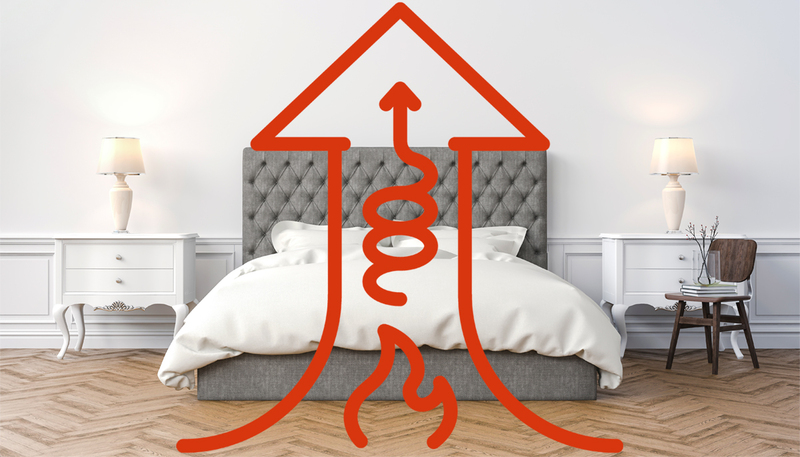 As people are becoming more and more aware of the importance of a healthy mattress, chemical flame retardants have thankfully become less popular. Again, this doesn’t mean that the problem has been completely eliminated, but we’re getting there. In fact, TB 117-2013, which involved switching from an open flame test to a smolder-only test, decreased the need for chemical flame retardants by making fire testing standards more realistic and reasonable. This was a step in the right direction and showed that if the furniture industry can improve, so can mattresses. Of course, you can always buy a Flame Retardant-Free Mattress in Raleigh Durham at Green Dream Beds. Currently in the mattress industry, three mattresses must be sent to a reputable lab and put through the open flame test in order to meet the standards of 16 CFR Part 1633. 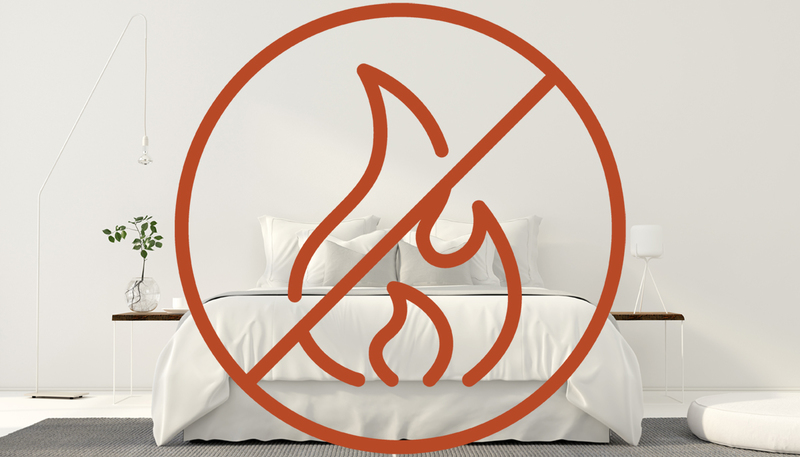 There are both synthetic and natural flame barriers found in mattresses today. Here are some facts you should know. Kevlar has been used as a flame retardant because it’s a sturdy and heat-resistant synthetic fiber found in tires and helmets. Kevlar is a type of plastic so it isn’t the most eco-friendly flame barrier. Rayon, the same type of fabric found in clothing, is also utilized as a flame barrier. The yarn inhibits the flames from spreading and quickly engulfing the mattress. We’re not a fan of this synthetic fabric though because it’s not necessarily free of harmful chemicals.Formaldehyde and Teflon are found in synthetic fabrics such as rayon, polyester, acrylic, and spandex. Another synthetic material we prefer not to use is silica. Using a silica sock as a flame barrier has also become very popular in the mattress industry. The sock stifles the oxygen necessary for a fire to grow. 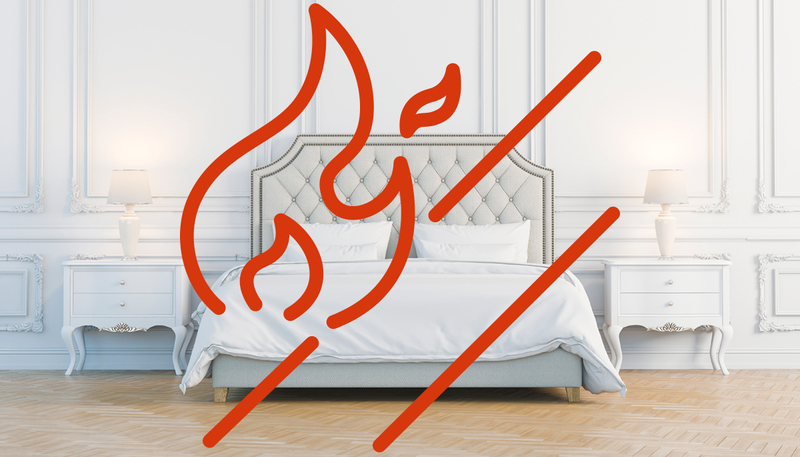 You will find this flame barrier used in a lot of polyurethane foam mattresses since it’s a cheap way to pass the burn test without using chemical flame retardants. Wool is more prevalent among natural mattresses but not all wool found in mattresses is certified organic, which means lower costs and fewer regulations. At Savvy Rest, we use certified organic wool batting as a natural flame barrier because we want to include the very best in our organic mattresses. Wool batting (as opposed to individual wool fibers) smolders and burns slowly which means it gives off less heat and because of its tight, woven structure, creates an environment that is not conducive to fire spreading rapidly. The wool batting in our mattresses is GOTS-certified organic. In fact, all of our customizable organic mattresses are completely GOTS-certified, giving our customers peace of mind.